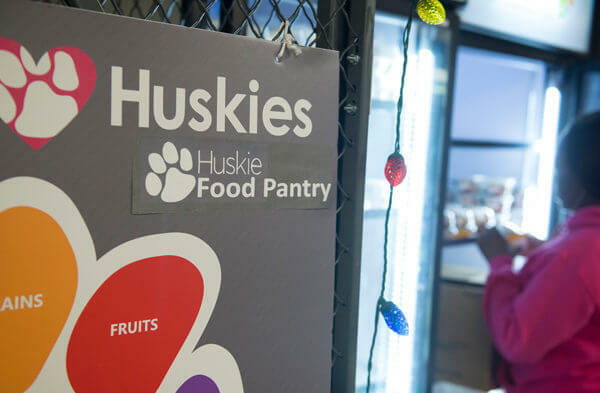 The Huskie Food Pantry, which moved onto Northern Illinois University’s (NIU) campus in June 2016, hosted its first NIU student intern in Fall 2016. In Spring 2017, the number grew to four interns who are supervised by staff in Student Involvement and Leadership Development and funded by the generous support of university donors. Through this opportunity, these NIU students have gained practical experience and skills in with marketing, logistics, and fundraising within in a non-profit setting. The Development Intern, Kylie Moran, focuses on securing funds through grant writing and event coordination for the Huskie Food Pantry. Moran is a junior majoring in Community Leadership and Civic Engagement. Her position has pushed her to be detail-oriented and creative. She has seen the pantry become more space efficient in her time working there, and in turn this has allowed more students to use the pantry and has improved the overall flow of the pantry as well.